geomedia | Building the Future of Augmented Humans with a Balanced Judgment, an Understanding of History and, above all, a Sense of Purpose. 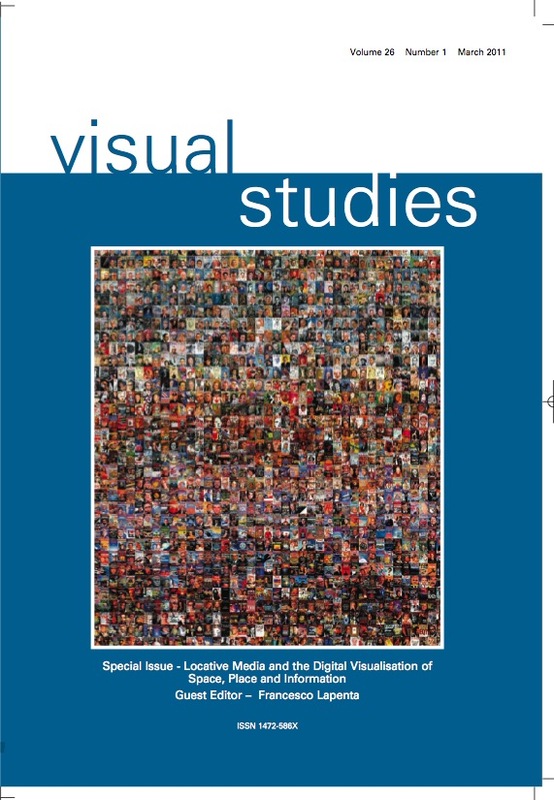 “Locative Media and the Digital Visualization of Space, Place and Information”, Lapenta Francesco Ed. As I described a long time ago in the GeoMedia study (hopefully soon to be published in an article) companies that have invested in Geomedia applications, such as google maps and street view will soon see and invest in the commercial potential of their administrated Virtual Space. The question is are we going to see a fight over representations of public space. 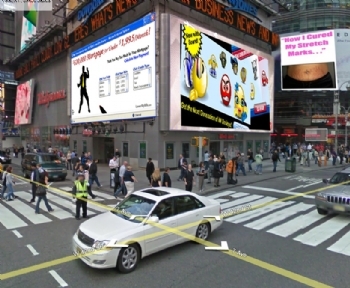 Landmark monuments would offer great location for virtual ads. Think the statue of Liberty or the Eiffel tower with a big “Apple” or “Coca Cola” ad rotating over them. We are only witnessing the beginning. Things are going to get more interesting real soon when companies institutions and private citizens will realize the potential use of their virtually represented spaces. 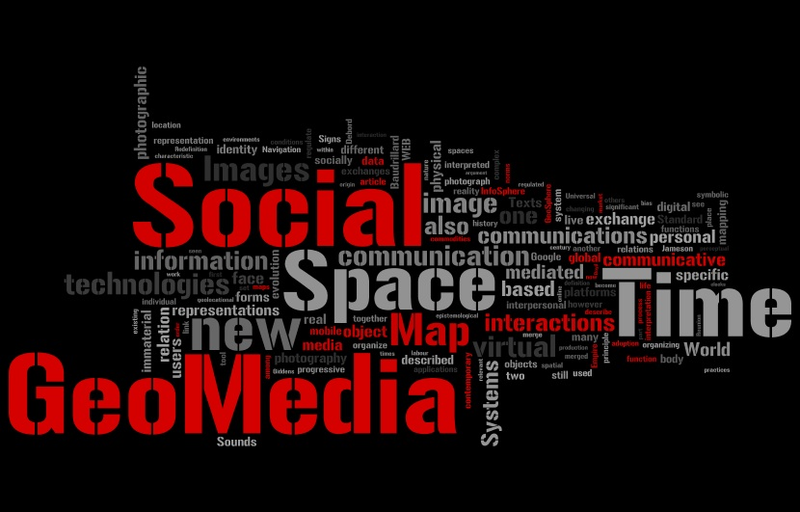 GeoMedia and the Rise of Social Navigation Systems. Finally a rough draft of the Geomedia article for you to browse. As you will see it is in a very rough form but wanted to bring it out to have feed back from you. The article discusses the new generation of location based technologies and the ways in which they will rearticulate our perception of time, commodification of space, digital merging of collaborative pictures, sound, and texts collections using WEB 2.0 tools and logics and available and developing softwares and services, PhotoSynth, Google maps, Flicker. The article also describes the social behaviors that will be favored by these new technologies (which I call Social Navigation Systems). Feed back are appreciated and needed so do write back with comments and ideas, anything suggested and used in the final article will be of course properly credited and accounted for. geomedia-and-the-rise-of-social-navigation-systems5th (Version 5, 2008 December). The article is set on private, please do e-mail me if you want to read the draft. New info about the article will be periodically updated here until completion and publication. This morning I left my studio in St Marks Pl ( 40°43’44.58″N, 73°59’18.82″W) at 09:13. I arrived at my favorite Caffe´, Taralluci e Vino ( 40°43’44.18″N, 73°59’4.38″W) at 09:21 and ordered breakfast, one big cappuccino and a plain croissant. When I placed my order on my mobile I was a little disappointed to see that my favourite chocolate croissants were finished. I always get a chocolate croissant with my cappuccino, I am a man of habits, I should have checked before going out and reserved one for my breakfast before getting there, but then again I know I would never do that, I have always been too lazy to organise things too much in advance. While waiting for my breakfast I start to plan my day. I first check my live contacts on my world map, I can see that my wife is still at work (55°40’59.30″N, 12°34’43.00″E). She will be there for one hour more it´s 15:24 pm in Copenhagen, and she normally leaves the office around 16:30. Maurizio, my brother, instead is communicating to his friends that tonight he will go to a concert, the concert is in a club I know really well “Il Covo” (44°30’28.24″N, 11°22’39.15″E) , Bologna. Hold on, let me see; ok, I can see that the “Futureheads” are playing there tonight, I know he really likes them. Let me check, hummm not my kind of music, we always had different music taste me and my brother. The cappuccino and the croissant arrive, I get a taste of both, delicious, the day is not really starting until I get my cup of coffee. Later today I have to meet with Dough who is coming from Pittsburgh ( 40°26’12.96″N, 79°59’21.33″W), but I can see on the live map that he is still 2 hours and 31 min away from New York ( 40°45’2.09″N, 73°59’36.89″W), the Amtrak live info system says that the train is on time, good. I get another sip of my coffee and another bite of my croissant, huuummm. I briefly check my e-mails, and turn on my online status. Within seconds Eric calls me, it´s really early, 06:31 am, in Arizona, Tempe (33°25’6.17″N, 111°55’59.10″W), I can see from the sun in the background that it is going to be another hot day in the Grand Canyon State, you really need to start the day early if you want something to get done with that heat. The phone vibrates, I check the Locator and tell Eric that we´ll chat later during the day, Locator is showing me that John is few blocks away and he is free, I send him my local call and invite him to join me for breakfast. I get another bite of my croissant, and briefly go trough my RSS feeds, one more sip of my cappucciono and i am on my to do list. I could not live without my To Do List and my Locator, too lazy to get in all the shops to find the things I need, I just set the list on my mobile and while walking around the city a vibration will tell me when I am in the proximity of a shop that has the items I require, the things I would like to see, the people i would like to meet. It´s 09:41 and John arrives, I smile to him, and put my mobile in my pocket thinking; how did I manage life before 2008? before the iPhone 2.0 and the whole mobile WEB 3.0. Go to the FORUM to discuss this post!